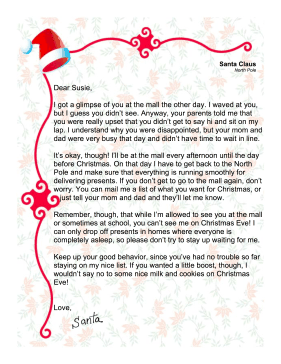 If your child is anxious or upset about not getting to see Santa at the mall or sit on his lap, give them this free, printable Christmas letter. I got a glimpse of you at the mall the other day. I waved at you, but I guess you didn't see. Anyway, your parents told me that you were really upset that you didn't get to say hi and sit on my lap. I understand why you were disappointed, but your mom and dad were very busy that day and didn't have time to wait in line. It's okay, though! I'll be at the mall every afternoon until the day before Christmas. On that day I have to get back to the North Pole and make sure that everything is running smoothly for delivering presents. If you don't get to go to the mall again, don't worry. You can mail me a list of what you want for Christmas, or just tell your mom and dad and they'll let me know. Remember, though, that while I'm allowed to see you at the mall or sometimes at school, you can't see me on Christmas Eve! I can only drop off presents in homes where everyone is completely asleep, so please don't try to stay up waiting for me. Keep up your good behavior, since you've had no trouble so far staying on my nice list. If you wanted a little boost, though, I wouldn't say no to some nice milk and cookies on Christmas Eve!